Official figures classify some fifty million of the world's people as 'victims of forced displacement'. Refugees, asylum seekers, disaster victims, the internally displaced and the temporarily tolerated - categories of the excluded proliferate, but many more are left out of count. In the face of this tragedy, humanitarian action increasingly seems the only possible response. On the ground, however, the 'facilities' put in place are more reminiscent of the logic of totalitarianism. In a situation of permanent catastrophe and endless emergency, 'undesirables' are kept apart and out of sight, while the care dispensed is designed to control, filter and confine. How should we interpret the disturbing symbiosis between the hand that cares and the hand that strikes? 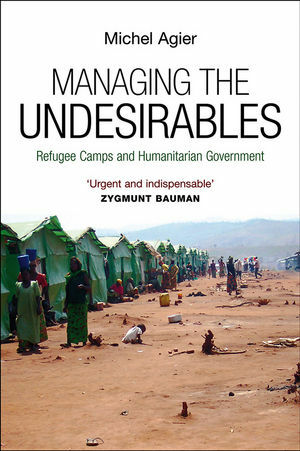 "One of the most important books on humanitarian assistance to emerge in several years." "An impassioned and tireless explorer of 'useless' and hence 'undesirable' populations, Michel Agier asks here about their future: how can they be returned to the human family, brought back from non-existence into the social world, from the camp to the town, from a life without time into history? How can they rediscover a place on the map of the world, and pass from the status of reject to that of subject? Urgent and indispensable reading for all who reflect on action to be taken, or are called on to take such action." Michel Agier is an excellent French anthropologist who works on an extremely important topic: refugees and refugee camps. This new book focuses on life inside refugee camps and detention centres, based on his research between 2000 and 2007 in Somali, Sudan, Rwanda, Angloa, Liberia, Sierra Leone and Europe. Agier explores the complex ambiguities of life inside the camps and the tensions, forms of power and protest that emerge within them, as well as the experiences, attitudes and despair of refugees themselves. This should have a readership in anthropology courses as well as a wider general readership.